ginormous thanks to local twitter friend @20tindevilla for insider tips and showing me around! Manila. BUT WAIT, you say, why would you ever want to go to Manila?! shopping – did you know the third largest mall in the world, SM Megamall, is there? some choice finds: the Uniqlos have Jollibee-themed shirts, and local chain Bench has some really cool local-artist t-shirt designs — and all for cheap. Intramuros – the heart of old Manila, and the performance-art-slash-tour by local institution Carlos Celdran are a must-do (and not only because you get free halo-halo at the end!). the shoe museum – the Marikina Shoe Museum has around 800 pairs of shoes from my soul sister, Imelda. oh and of course, FOOD. plenty of choices and who doesn’t like Filipino food? that’s right. no one. ok, now to the topic at hand. i wanted to get around on the cheap, and here’s what i learned. of course, it goes without saying that you’ll want data coverage for pretty much all of these options. cell phone service can be…trying at times, but it’ll work, eventually. Metro Manila is huge. it’s sort of like Los Angeles in that you talk about it as a ginormous city when it’s made up of a lot of smaller cities. 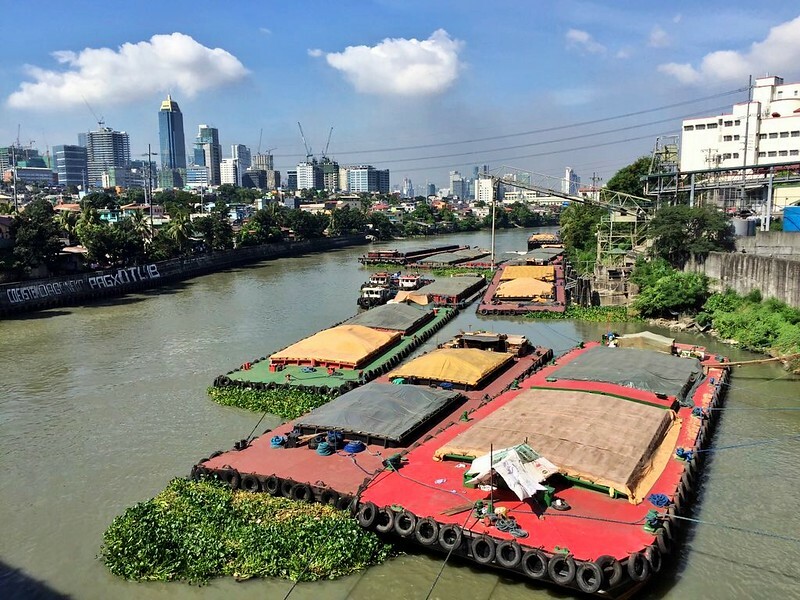 the city named Manila is only a small part of it. 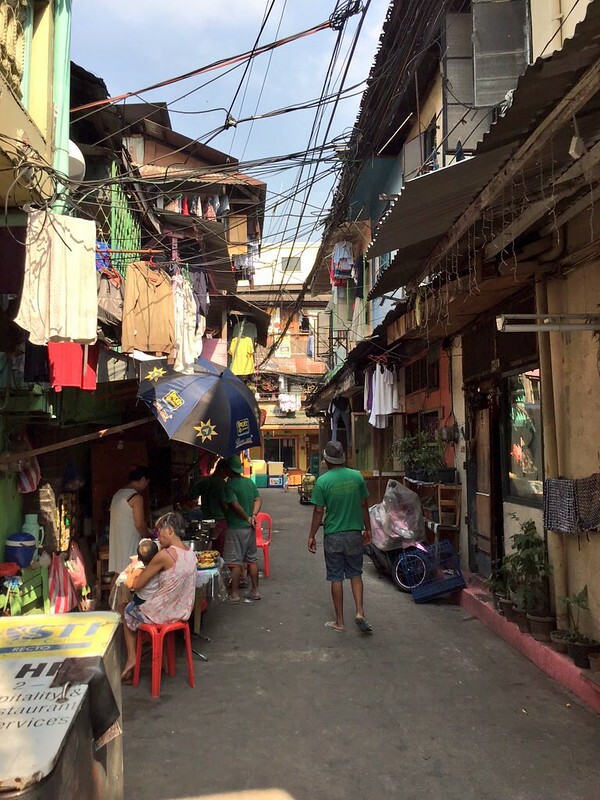 once you add in the surrounding areas, Manila is the fourth largest urban area in the world by population. with a high population density and lots of people driving, it can be pretty chaotic. “Ph fil metro manila” by Adkranz – Own work. Licensed under CC BY-SA 4.0 via Commons. 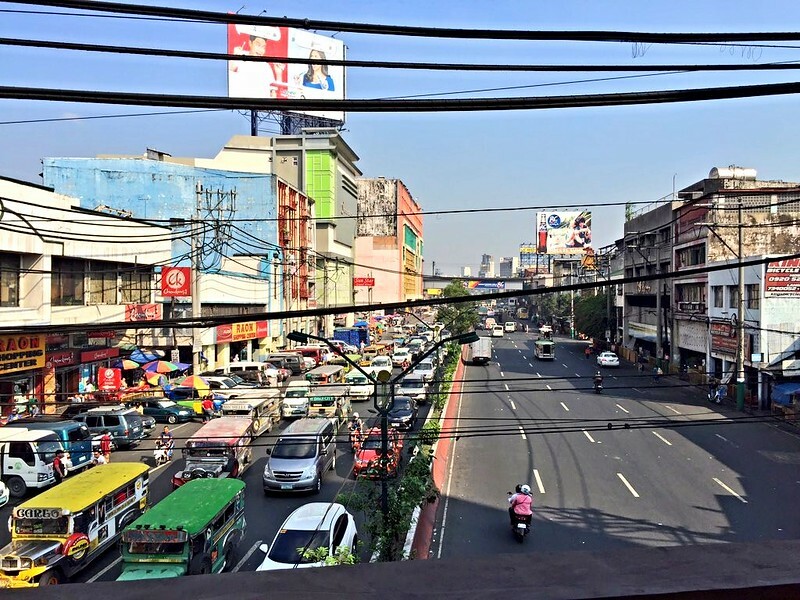 Manila is not pedestrian-friendly, but there are times when it just makes sense especially because traffic is so bad. and who doesn’t want to explore a bit? keep in mind though, that it’s hot and there may not be sidewalks. that said, you can find yourself in some interesting places. 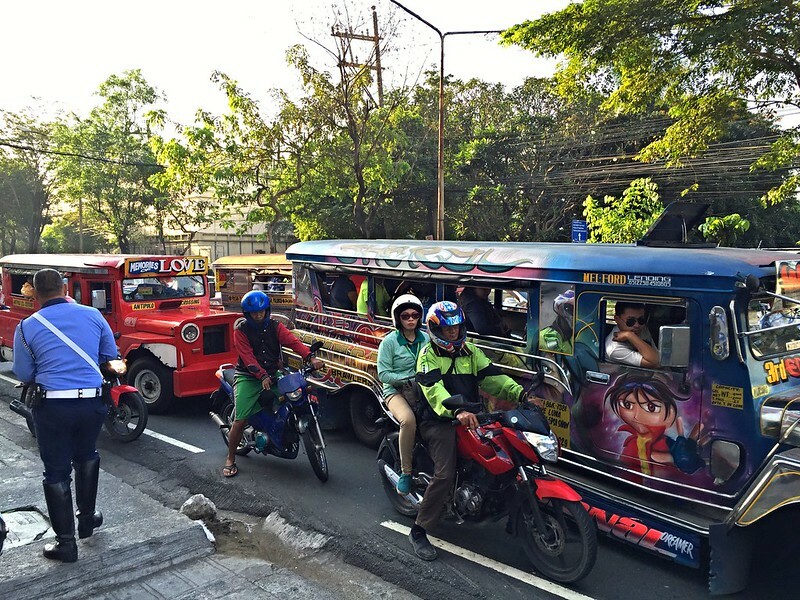 that last picture is a pretty good indication of the shittiness of Manila traffic. and, of course, it’s always stop-and-go in the direction you’re heading in. in fact, it’s not unusual for trips from one side of the town to the other to take over an hour. i used Uber quite a bit while i was there. it’s popular among the locals but despite its popularity (or maybe because of it? ), sometimes wait times for a car could be up to 15-20 minutes. it’s quite affordable, compared to other cities. 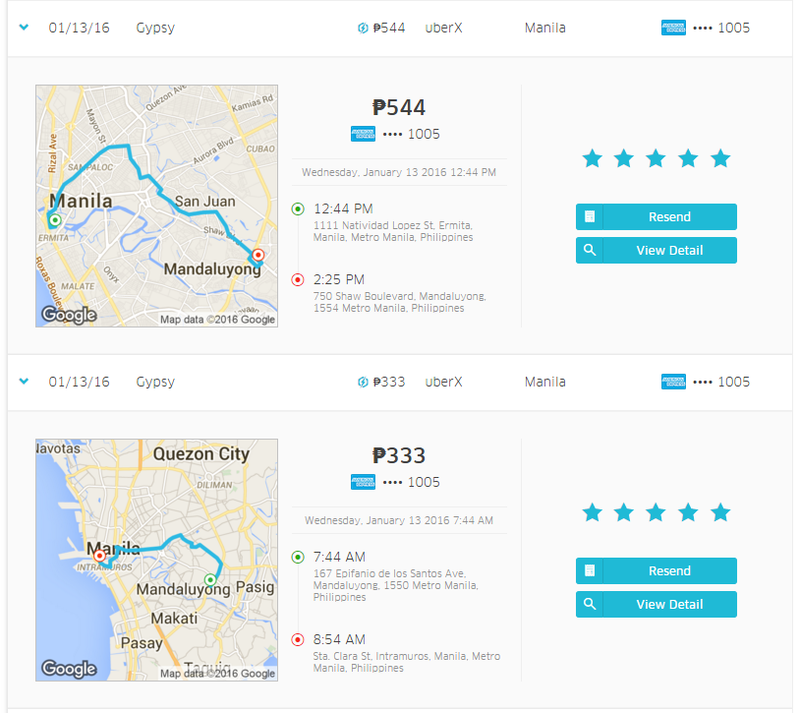 the top ride in the screenshot below was my trip back from the SM City Manila Mall to the apartment in the afternoon; the bottom one was my trip out to Intramuros in the morning. equivalents in USD, respectively: $11.40 and $6.98. note surge pricing was in effect both times. my drivers were friendly and you’ll thank the powers that be for the air conditioning. i was also told there’s a popular app called GrabTaxi (used throughout Southeast Asia, i gather) which will get you an assigned taxi and display an estimated fare (they charge a 70 peso / $1.47 booking fee), but i didn’t use it because i didn’t find out about it until later, plus i liked not having to make sure i had enough cash on hand. from the airport ugh, DON’T DO THE FIXED RATE TAXI THING. more like fuxxed rate. i fell for that scam and paid a lot more than i should have. you wouldn’t believe it if i told you (my airbnb host and friend were incredulous and shocked). i did try to Uber it but the arrivals area of Terminal 1 is a hot mess so the driver and i never connected. thanks to people who told me (too late though lol) to take a cab from the departures level. anyways, when i was leaving Manila i took an Uber from my apartment to the airport and the pricing was a lot better ($5.16). again, allow a lot of time to get there. ahh, the jeepney. 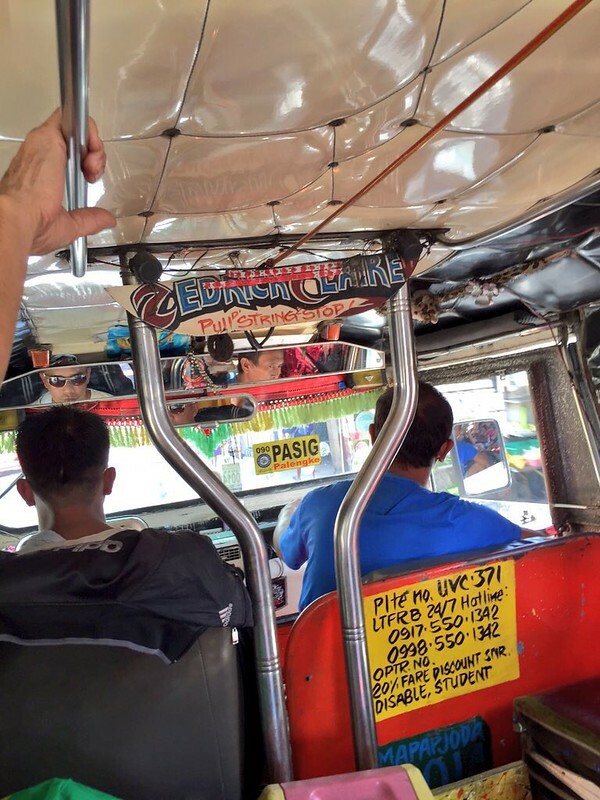 you can write (and there are, very invaluable ones) entire blog posts on how to ride a jeepney, but i’ll summarize the basics. 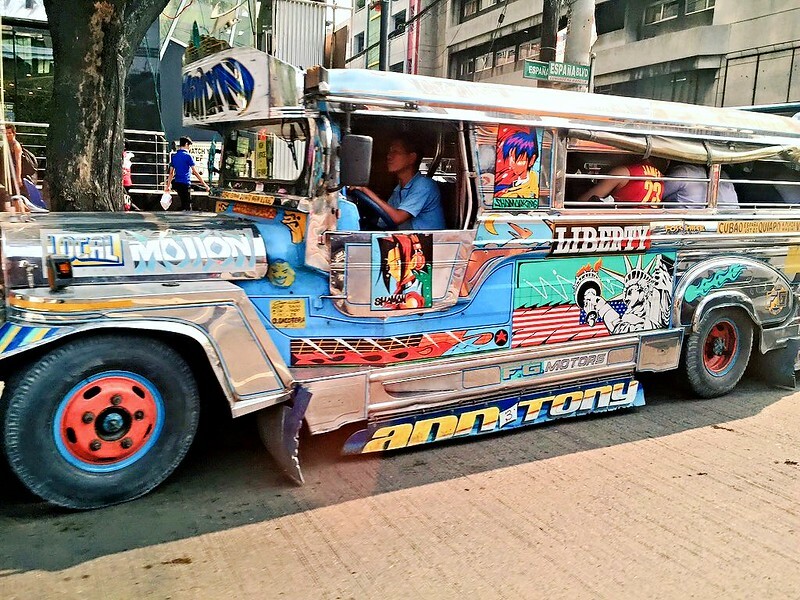 jeepneys are not only a cultural icon of the Philippines but a very common, highly-used mode of transportation for locals, functioning pretty much as buses. yeah, they’re really intimidating to use, but if i can do it, so can you! so think of them as buses but you can flag them down and stop pretty much anywhere along their route. however, there are certain popular spots where pickups occur. you can sit in the front (unless there’s a conductor up there who will take the fares — relatively common but not prevalent) or in the back. IMHO the front is more comfortable, but there’s no seatbelt and usually no door. it can get quite crowded, especially at popular stops where there may be a barker who will try and cram as many people into one as possible. how do you know which to take? if you’ll notice, you’ll see the route written on the sides of the vehicles on a painted yellow strip — you’ll see it on the front as well, but smaller. unless you’re at a popular stop, you’ll only have a few seconds as the jeepney is passing to see which route it’s plying. ok, but how do you know which one/ones to take to your destination? enter lifesaver website and app, sakay.ph. input your starting location (or let it find you) and your destination and it will show you which jeepney(s) you will have to take. for the most part it’s pretty accurate but because routes are not really set in stone, and due to the way they had to gather data (=someone sitting with a smartphone GPS recording the route), it may or may not be 100% accurate, but it will get you there. for most routes it will give you three choices. if you need to make a transfer, it will tell you where to do it. note that it gives you the estimated price, which is GREAT because it’s distance based and locals just know how much it’ll cost. just like how they know where to pick it up and which route they need and where to get off. but of course, for us, there are no signs or directions. just this app. the hardest part for me was knowing when to get off — i never knew if the driver would zoom off past my destination point so i always ended up getting off a bit early. even though i followed the blinking blue GPS dot on the app, i still was apprehensive. note the cost: the ride above, from the apartment to Manila city, almost as far as i went to Intramuros, was ₱15 (i gave ₱20 expecting ₱4.50 in change like sakay said i should get, but i got ₱5 back, for whatever reason). that’s less than $0.32. of course, if you make a transfer, you will have to pay twice, but since pricing is distance-based, it sorta works out. so how do you ride one? get on the side of the street that has traffic going in the right direction. 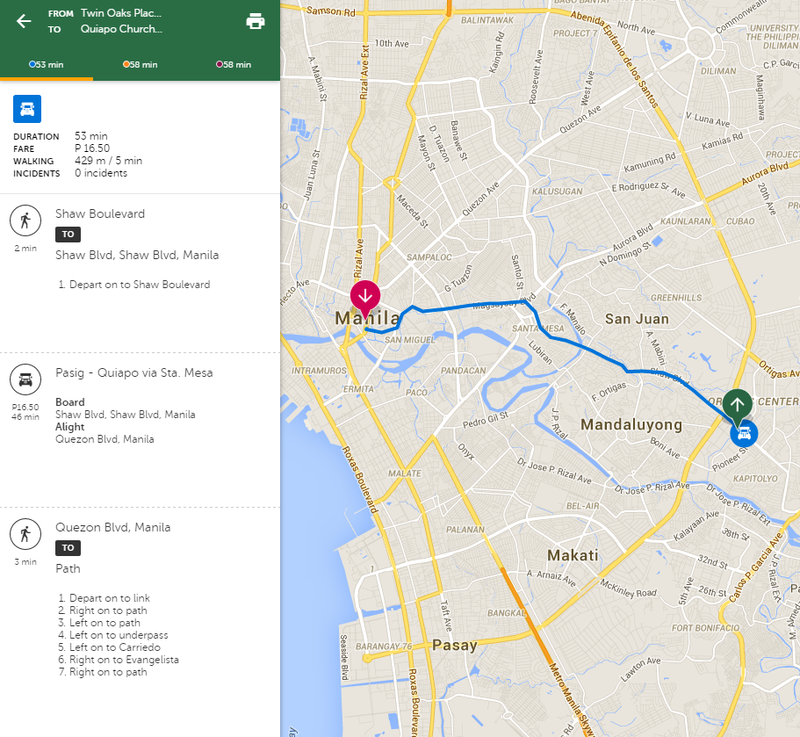 find a jeepney that has the route you want (in the screenshot above, one that says PASIG – QUIAPO) on the side. maybe more importantly, find one with room. 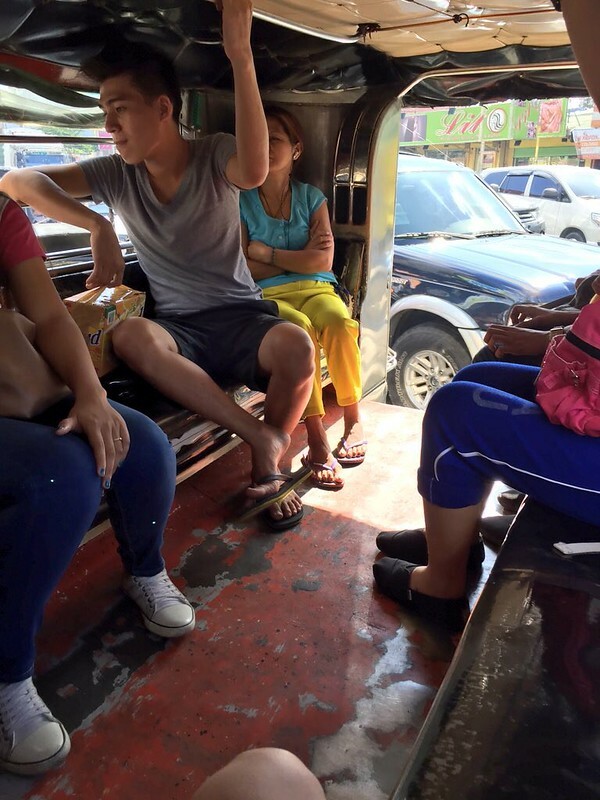 in a standard jeepney they can fit 10 people on each side of the back and 2 people crammed into the front seat. you may need to flag one down if you’re not a popular stop where a lot of people get on and off. once you get on, hand your money to the driver/conductor (whoever you see people paying). in the back, the more forward you sit (the closer to the driver) the more likely people will pass their money to you to pass to the front (and then the change going back) — and this is why people like sitting further away so they don’t have to be bothered. if you’re seated right behind the driver, handing money back and forth will pretty much be your job. because i was never 100% sure if i was on the right jeepney (=the right route), i always climbed up close to the driver so i could make sure he knew my destination and to make sure it was on his route. either way, you’re supposed to say your destination as you pass the money up or when the driver gets your money (when they look at you in the rear-view mirror) so they will remember you and give you change if appropriate. it’s customary to only hand the driver money when he doesn’t have a lot to pay attention to on the road or when the car is stopped. note that while a lot of people in the Philippines speak English (it’s an official language), jeepney drivers are less likely to. when you want to get off, say para po (you don’t really have to shout it, just make sure the driver hears it) and get off when the car stops. some people say you can knock on the overhead handlebar with a coin but i only heard this once or twice. most people just go para po. this jeepney below had a cable to pull when you wanted to stop but i’m not sure if it was broken or if people just didn’t use it, but no one touched it. p.s. i’ve heard stories of being pickpocketed or having your phone stolen, but i kept mine out (if only to track my progress/route or to pass the time by tweeting) — just be super vigilant. there are white minivans/SUVs called UV Express which have real seats (unless you’re stuck in the trunk, just sit on the floor with your back to the side wall) and air conditioning! they ply popular routes with, i believe, set stops. of course the cost is a bit higher (but still cheap). i don’t know where exactly you pick them up but if you see them stopping and you see them going where you need to go, it’s definitely more pleasant than a jeepney, especially in the afternoon heat or the rain. there are also pedicabs and tricycles, bikes or motorcycles (respectively) with a cage-like sidecar attached to them, but they only go short distances. i didn’t try one except for during the Intramuros tour. in Intramuros and other touristy areas there are also horse-drawn carriages called kalesas. 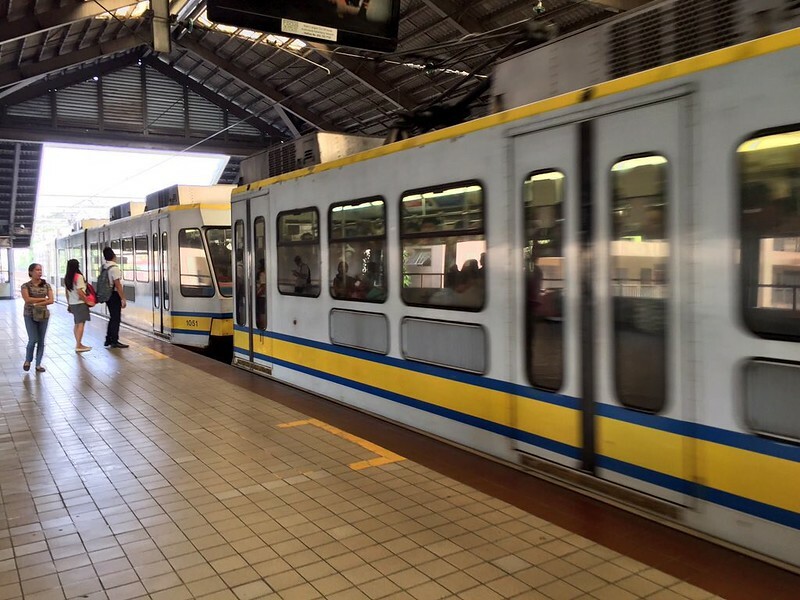 there are three rail lines in Metro Manila and these can be a great alternative if the stops are handy. if you refer to the Google Maps screenshot above, you’ll see that the length of time it takes to ride the train can be similar, if not better than, going by a street vehicle. “Manila metro” by Laura Sun – Own work. Licensed under CC BY-SA 3.0 via Commons. i took the train from Central (on the green line / LRT 1) to Shaw (on the yellow line / MRT). note that interchanging between these two lines requires paying twice (and exiting and re-entering at the separate transfer stations). the fare is distance-based: it cost me ₱20 from Central to EDSA and another ₱20 from EDSA to Shaw. the trains were air conditioned. the worst part is waiting for a ticket — the lines are long; expect to wait at least 3-5 minutes in line. you’ll get a single journey ticket that you tap on the turnstile to enter. 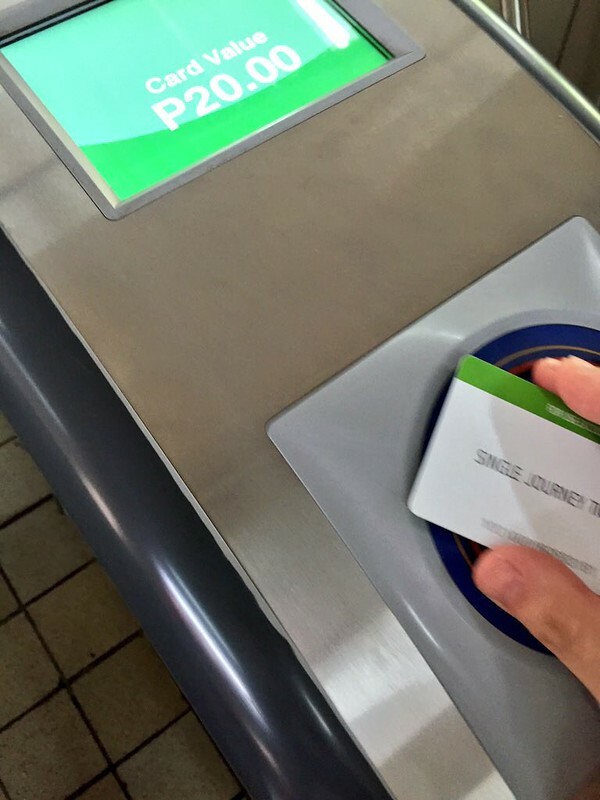 to exit, insert the card into the slot in the turnstile at your destination station (you won’t get the card back). there is a stored-value card but i didn’t ride the train enough to warrant buying one. so, which mode of transportation to choose? if comfort is key (or if you’re going from/to the airport), go for Uber or a GrabTaxi cab. if where you need to go and where you are at the moment are both located near a train stop, use the train or combination of trains. otherwise (especially if you are on a budget) be adventurous, take a jeepney! the key, no matter what, is to budget in a lot of time for getting around. A LOT. but you’ll get there and you’ll have fun doing it! 3 Comments on "Getting Around Metro Manila via Jeepney and More"
Thank you so much for the information on the jeepney! We’ve been trying to find out how to use them and your description is perfect, so helpful! No prob! Have a great trip!